"I'll take 'Games That Don't Need To Exist' for 400, Alex." Tiny Toon Adventures was, as you probably already know, a popular Warner Bros. cartoon in the early-to-mid-1990s, with reruns spanning from 1992 to the present, far more than two decades after the end of its production run. It was basically a Junior Edition of Looney Tunes, with miniature child-like descendants of older characters taking the spotlight as they attended Acme University to learn how to be "wacky" and were taught by the legends themselves. But I highly doubt that dropping coloured eggs was a course at the university! Lacking in any notable spirit of egg-celence. 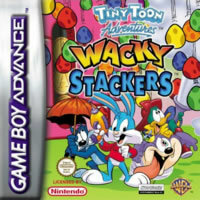 Following directly in the footsteps of the almighty Puyo Puyo series, Wacky Stackers has you playing a puzzle game that has nothing to do with the Tiny Toons or their adventures. Your goal is to make eggs disappear as pairs of different coloured eggs fall from the ceiling of the playing field. Connecting four or more eggs together in some way will make them disappear. It also pays off to have eggs fall from above one reaction and land below to create another, resulting in a combo, for more points and, of course, fewer eggs to then deal with. In other words, it's Puyo Puyo. If you combine four eggs in a square formation, they will congeal to form a large egg that only disappears if it touches another group of disappearing eggs. First off is Survival Mode, which is basically seeing how long you can last before the game either gets too fast or you get bored and go poke the neighbour's cat with a stick. 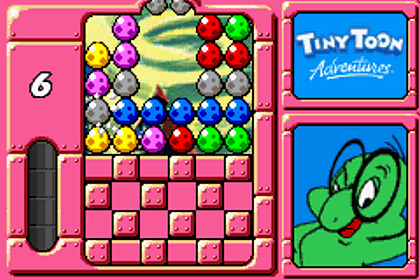 The second, more engaging part is Puzzle Mode, during which the local Tiny Toons offer five of their own mind-boggling egg puzzles! If you succeed, you'll mildly impress them; if you fail, it's straight to the Continue? 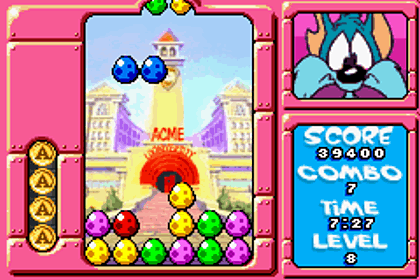 screen, where Montana Max will desperately grip a bomb, hoping you'll keep playing before it explodes in his face, causing the standard "oh, look, I'm covered in black soot" response. You can also play against the computer in a one-on-one ovular deathmatch or, if you've got the right sweet, sweet hookups, you can play against up to three others in Multiplayer Mode. Now then... See if you can solve the following "puzzle". ...which would be nice if they treated them with the respect they deserved! Look at this! They didn't even use actual art from the show! Someone just grabbed their nearest cousin and made them an art director! Buster Bunny looks like his dollar store knockoff doppelganger, Booster Bunny! At least the characters look normal during the gameplay sequences, but come on, get your character models a little closer now. The music hurts. Much of it was composed using only the notes available from the backside of a bull. Some of it is so disjointed, you'd swear you were having a seizure right that moment. The actual gameplay tunes aren't too bad, although they don't make me think about whismy as much as they remind me to double check whether I turned off that blaring bland local radio station. And if you're looking for funny sound effects, think again. Most of what you'll hear is the eggs disappearing, and we hear a ghastly crunching noise. I think I'm ready to call it quits on gaming now. Though not a terrible game by nature, Wacky Stackers is a cash-in. 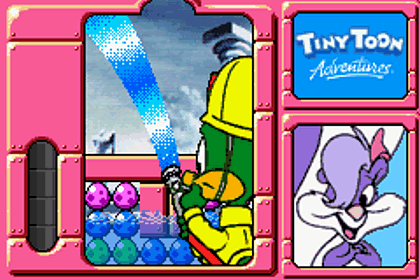 The Puyo franchise has already been doing this for ages well enough, and throwing Tiny Toons into the mix doesn't add anything new or notable to the formula. And, to add injury to insult, it's not even that wacky! We've been duped! Had! Bamboozled! Scallywunked!